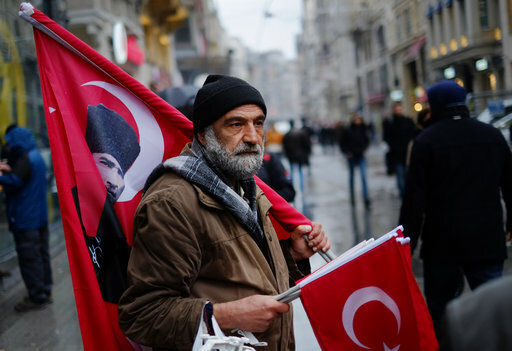 ANKARA, Turkey (AP) — Turkey’s Foreign Ministry on Monday summoned a Dutch diplomat to formally protest the treatment of a Turkish minister in the Netherlands over the weekend, and what it said was a “disproportionate” use of force against demonstrators in an ensuing protest. The Dutch Embassy’s charge d’affaires, Daan Feddo Huisinga, was called to the Foreign Ministry where a senior official handed him two formal protest notes, the ministry said. The first protested against the treatment of Family Affairs Minister Fatma Betul Sayan Kaya, who was escorted out of the Netherlands after she entered by road from Germany to try to attend a rally to promote a constitutional reforms referendum in Turkey next month. In the note, the Turkish Foreign Ministry condemned what it said were practices contrary to international conventions, diplomatic courtesy and diplomatic immunities and requested a written apology from the Dutch authorities, a ministry statement said. Turkey also reserved its right to seek compensation, the Dutch diplomat was told. The second note protested the treatment of Turkish citizens who had gathered outside the Turkish Consulate in Rotterdam, saying “disproportionate force” had been used against “people using their right to peaceful gatherings. It added that Turkish nationals had been subjected to “inhumane and derogatory” treatment and called for those responsible to be identified and punished. It was the third time that the Dutch diplomat has been summoned since tensions broke out between the two countries after two ministers were prevented from campaigning in the Netherlands. In addition to Kaya being escorted out of the country, Foreign Minister Mevlut Cavusoglu was denied permission to land to campaign for the April 16 referendum that would greatly expand the powers of Turkish President Recep Tayyip Erdogan. The Dutch government meanwhile, had no immediate reaction to news that Turkey had summoned its top diplomat. It however, updated its travel advisory for Turkey, a popular vacation destination, warning travelers about the heightened diplomatic tensions. “Be alert and avoid gatherings and busy places throughout Turkey,” the advisory warns. On Sunday night, Dutch riot police were called in to end a protest by Turks in Amsterdam and arrested 13 people, spokeswoman Marjolein Koek said. Media showed police with dogs and a water cannon being used to disperse protesters in western Amsterdam. Erdogan on Sunday vowed to retaliate against the Netherlands after claiming that “Nazism is alive in the West.” Dutch officials have condemned the statements. Copyright 2017 The Associated Press. All rights reserved.